Cook the fries on a baking sheet according to package directions. 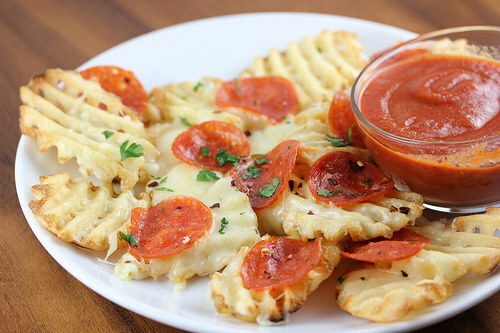 Remove from the oven and sprinkle with shredded mozzarella cheese and top with pepperoni slices. Return to the oven and bake at 350 degrees F. for 5-7 minutes or until the cheese has melted. Remove from the oven and sprinkle with parsley and serve with pizza sauce for dipping.